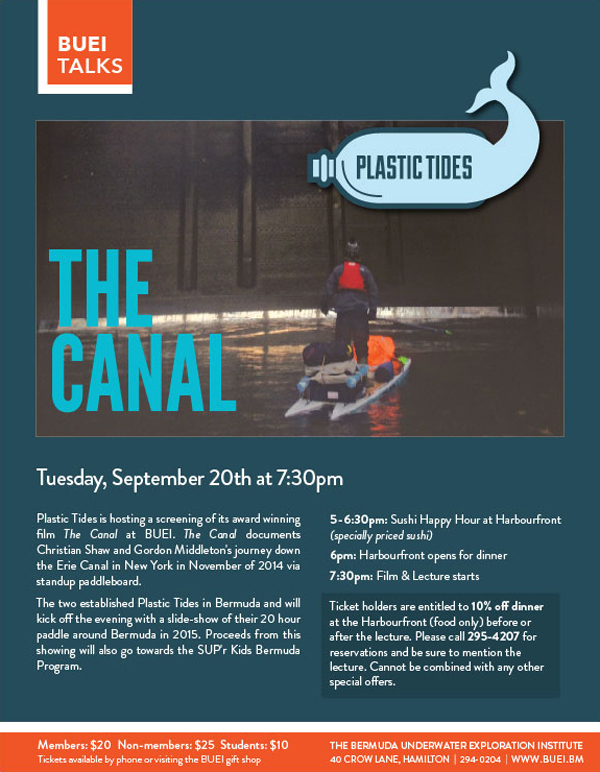 Plastic Tides will be hosting an event at BUEI about their award winning film ‘The Canal’ on Tuesday, September 20 at 7:30pm. The event poster says, “Plastic Tides is hosting a screening of its award winning film The Canal at BUEl. The Canal documents Christian Shaw and Gordon Middleton’s journey down the Erie Canal in New York in November of 2014 via standup paddleboard. Tickets are $20 for BUEI members, $25 for non-members, and $10 for students. It available by phone or visiting the BUEI gift shop. For more information visit The Bermuda Underwater Exploration Institute at 40 crow lane, Hamilton, call 294-0204, or visit their at www.buei.bm.